So there you have it. It’s right there for you to see. I have a certain kind of oblivion when it comes to sports. It’s a big blank spot. I’m trying to understand it. 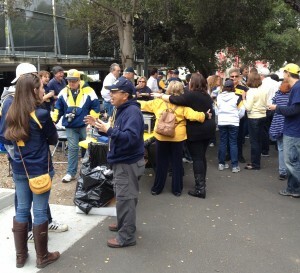 It hit me just this season when I actually did go to a Cal game, my first one. I took this picture. Look at how everyone is looking at the field. Not only those guys in the foreground who have a film noir look about them, but look at the thousands of fans out there, in the cold, mind you, jammed into seats to watch. Are you kidding me? I was warm and cozy in the Chancellor’s Suite and quite frankly I could barely find enough to do to pass the time. Imagine if I were stuck out there in the cold with nothing to do BUT watch. In fact, my distractions were pretty nice. 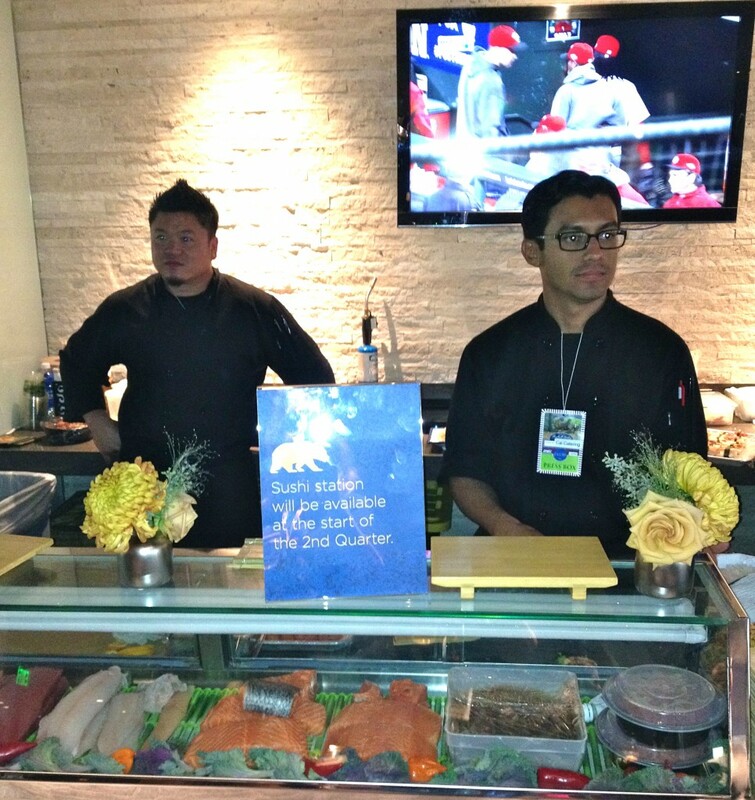 I spotted this photo opportunity as I was casing the incredible food spread right behind those guys. A loud cheer probably made me look out toward the field. Hey guys, turn around, there are drinks over here and hot dogs and macaroni and cheese and even blue and gold M&M’S! …I was trying to figure out what had happened to me. Why don’t I have a relationship with A Big Sports team? 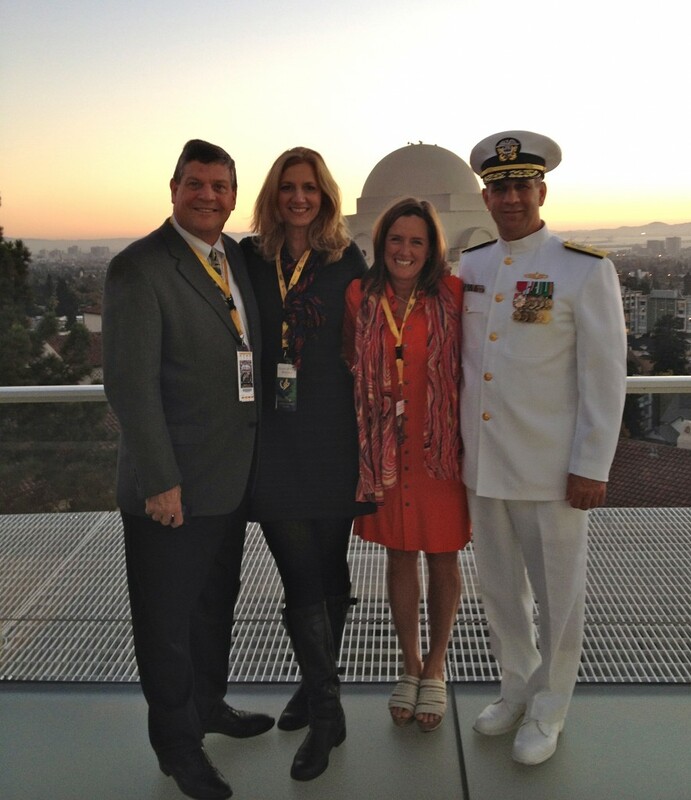 My friend Lisa Rockwell actually drives from LA with her family to watch her Big Sports Team play – Stanford. Sometimes she comes up alone, just to watch a game. She thinks her team might not win if she doesn’t go. 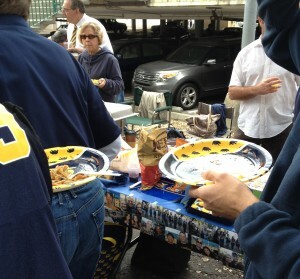 While I was looking around at those fans decked out in blue and gold, I felt like Spock from the U.S.S. Enterprise who was forever trying to understand human emotion. I was grappling with FAN emotion. I mentioned to one that I liked his hat and he said if he wears it a certain way, it increases the chances of his team winning. Really? Now why don’t I have inane ideas like that running around in my head? I started thinking about my brushes with Big Sports Teams. I hadn’t had that many and each of my attempted interactions seemed to be fraught with problems. It began with the New Orleans Saints. Eddie Smith was the first fan I’d ever met. We called him Eddie Spaghetti. He walked around our Slidell, Louisiana neighborhood holding a transistor radio up to his ear listening to the efforts of the Saints, who in those years, seemed to lose a lot. While Eddie was pacing our block listening, my family gathered on the couch to watch. I would try – I wanted to be with everyone – but what I remember most were the pleas for me to give up coveted couch space, “Joyce if you’re going to read, go somewhere else,” or, “Joyce if you’re going to sleep, go up to your room.” So, even early on, I didn’t have what it takes to be a fan. But some of my failed sports team interactions weren’t really my fault – like the time when suddenly the San Francisco 49ers were my local team. My family had moved to California and a date took me to Candlestick Park to watch a cold and wind whipped 49ers game. I was freezing -miserable – I hated it. That’s a lot to endure just to watch a game. I get the move to Santa Clara. Later, I went to UCLA. I only went to one game there. The only thing I really remember is the long ride to get to the stadium. Now, THERE’S a sports team that needs a new stadium. I bet if the stadium were on the UCLA campus I might even remember I’m a Bru-IN. Anyway, back to me at the Cal game. After I walked around and admired the new stadium and ran out of things to look at and eat, I went back to my seat. I tried to figure out what to look at on the field. It looked like someone was about to make a touchdown. Then they did. It was Cal. The crowd went crazy! I stood up and cheered too. It was exciting. I turned to my husband and he didn’t look that happy. It was loud. He said, “We’re Bru-INS.” I pretended I didn’t hear him. 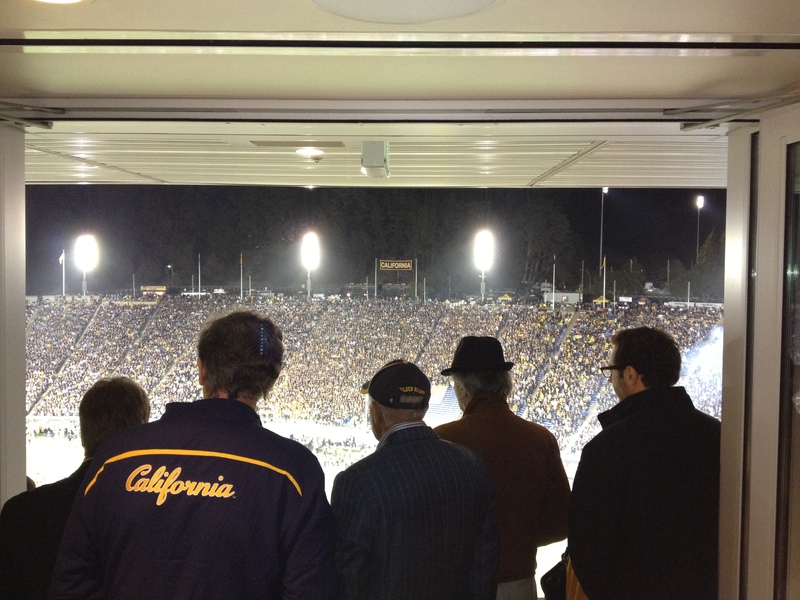 I had finally gotten to cheer for Cal, my neighborhood team, playing my alma mater. It was a surprise victory that night. Cal won. Just like a fan, I’d like to think I had something to do with it. And so, on the heels of my first real fan experience and on the eve of the Big 49er’s Game – I’m thinking of all of you crazy fans with your rituals and superstitions and inane ideas. Good luck… I hope it all works for you. Dare I say it: Go Niners! Is that right? Or do you say the whole thing: Go 49er’s? This entry was posted in Things I Don't Get and tagged 49ers, Berkeley, CAL Bears, Cal Football, football, Memorial Stadium, New Orleans Saints, sports, UCLA Bruins by jhunting. Bookmark the permalink. So funny and this is coming from a fanatic NFL fan!!! I love your honesty Joyce. You keep trying to be a fan. i read this in class and had to stop myself from laughing out loud a few times. now i understand why i don’t care about sports either. i guess i get it from you. Joyce honey, you and I do sports for the same reason, food and drink! I am surprised that so many people feel the same way. I thought there was a little crew of us aimlessly wandering during the game… now I am sure of it! Yes, I might try that Giants thing some day!